Dan Hughes consults with Moriah Jefferson during a 2016 preseason game. Photo by Tim Clayton/Corbis via Getty Images. 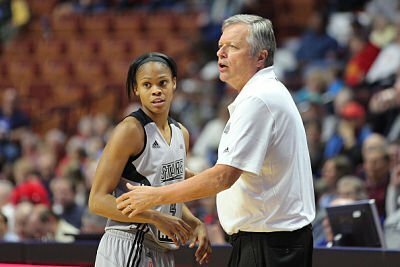 For most of the past two decades, he patrolled the sidelines in the WNBA — first with the Charlotte Sting, then the Cleveland Rockers, and for nearly a decade, the San Antonio Stars — before retiring after the 2016 season. But his farewell proved to be short-lived, as the Seattle Storm announced him as their new head coach Wednesday. 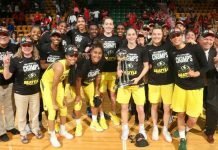 Hughes said the lure of coaching veteran All-Star Sue Bird, and a pair of budding young stars in Breanna Stewart and Jewell Loyd, was too enticing to pass up. 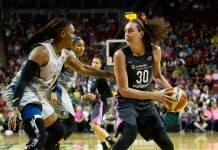 “Nothing in my life could I find that was as fulfilling as when you’re on the court, and you’re involved with a player and the learning process of basketball,” Hughes said. The 62-year-old fills the role held by Jenny Boucek, who was let go with eight games remaining in the 2017 season. He is the franchise’s fifth head coach. Twice named WNBA Coach of the Year, in 2001 and 2007, Hughes returns to the bench already having coached more games — 524 — than anyone in league history. After spending the past year as a TV analyst and traveling from Canada to Mexico to help out at basketball clinics, “wherever anybody would ask me,” he didn’t find anything that quite imitated the experience that teaching basketball had for him for so many years. When the opportunity in Seattle arose, Hughes was interested immediately. He said the team reminded him of things he liked about basketball, and he felt the coaching opportunity was special, not just because of the talent on the roster, but how that talent could mesh. However, he said he needed the blessing of his family to take it. His wife didn’t hesitate. Now, he inherits a team that made the playoffs for a second-consecutive year, but one that many felt under-performed, with 10-time All-Star Bird, and back-to-back first-round draft picks and Rookies of the Year in Loyd and Stewart. En route to a 15-19 campaign, Seattle averaged 82.6 points per game, while allowing the same. He had high praise for Bird’s leadership. He’ll now be tasked with making the most of that talent, while Valavanis retools the rest of the roster for 2018. 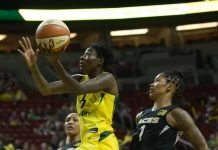 Seattle currently holds the fifth pick in next April’s draft, and has decisions to make on free agents Crystal Langhorne and Carolyn Swords. In the meantime, Hughes also needs to compile a staff. Retaining Gary Kloppenburg – the assistant coach who filled in for Boucek at season’s end – and assistant Ryan Webb is a consideration.